Cruising Cuba, a first timer’s perspective. I will be writing a number of articles and giving a few talks about our visit to Cuba over last winter. I thought that it might be fun to share a draft of one of these articles with you. It includes a number of links to prior posts, both Brenda’s and mine. Since the 1950s and the beginning of the US trade embargo, Cuba has been largely off limits to Americans. This, combined with very limited capital for investment, has made for a country that has been, in large part, “frozen in time”. To visit Cuba now is akin to taking a step back into the Caribbean of the 1940s and the time of Hemingway. Brenda and I have wanted to visit Cuba for many years and as relations between our two countries have begun to thaw, we decided to “jump the gun”, before things really begin to change, and head there aboard Pandora for an extended two month visit in early 2016. Receiving needed approvals to visit Cuba for an extended visit from “Uncle Sam” proved to be quite tedious and involved nearly six months of research and much back and forth with three government agencies, Commerce, State and the USCG. Finding someone to insure Pandora during our visit was not finally resolved until a few days before we headed to Cuba from the Bahamas. The US government currently allows Americans to visit for twelve reasons, with a journalism general license the “reason” we chose. 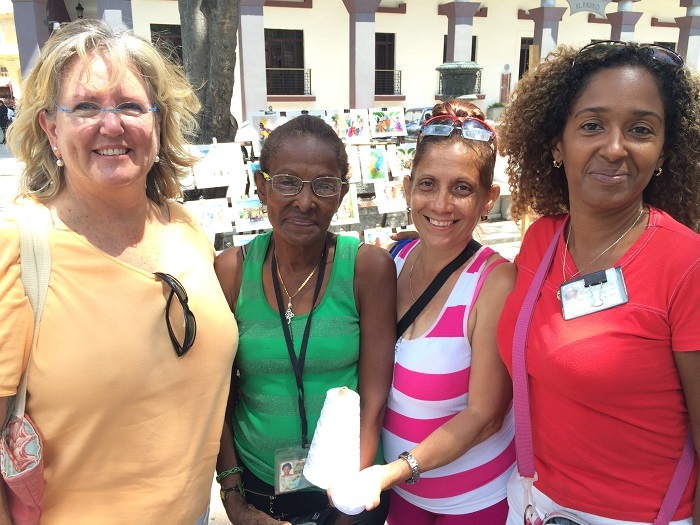 As part of this effort, Brenda’s goal was to better understand the fiber arts of Cuba, of which little has been published. In particular, she wanted to find one particular woman in Havana who had been featured in another American’s blog post several years ago and, believe it or not she found her. This is Brenda and “the girls”. Cuba is a large island, much bigger than most realize, over 600 miles long, and our trip long took us along the entire south coast and a good portion of the north coast. Along the way we found ourselves about 100 miles, a mere overnight run, from Jamaica, The Caiman Islands and Cancun on the Yucatan peninsula. All much closer than most realize and as Cuba becomes more open, this will likely change cruiser’s perspective of what it is to visit “the Caribbean”. The ability to use Cuba as a jumping off place to Central and South America, will make the western Caribbean much more accessible to Americans than has been the case for a great many years. Visiting Cuba isn’t for the “faint of heart” as there are very limited services and even fewer marinas, especially along the less traveled south coast. 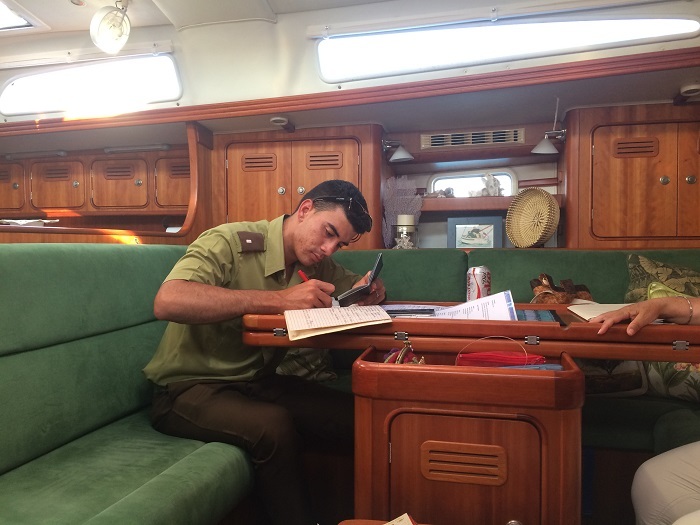 This combined with the requirements of the Guarda Frontera, a sort of military coast guard that makes you check in and out of most of your stops along the way can make it challenging at times for those of us who are used to going where we want, when we want to go. However, if you can make a point of learning to “go with the flow” you will probably find the process quite straight forward and perhaps even charming. And, finding internet access can be remarkably frustrating as it’s mostly available in government run tourist hotels. In one case, we actually took a horse and buggy to check our e-mail. Talk about culture shock. Our travels brought us south through the Bahamas to Georgetown and then a three day run south traversing the Windward Passage, past Haiti, around the eastern tip of Cuba and west to our port of entry, Santiago de Cuba. The process of clearing in with Pandora and getting our Visas approved was quite an experience. 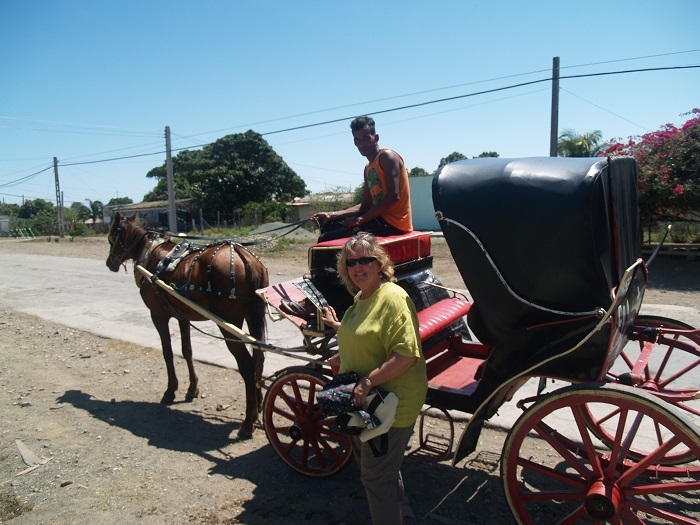 We both wrote posts about this and our visit to the city of Santiago de Cuba. 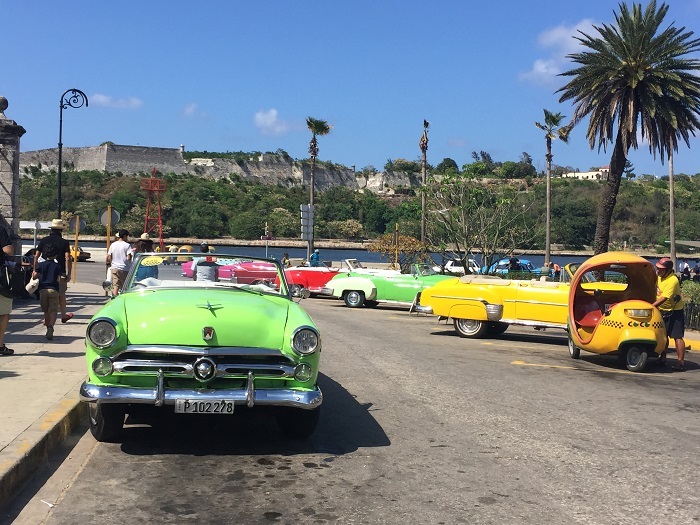 Of course, everyone thinks of vintage American Cars and remarkable Colonial architecture when they think of Cuba and we saw plenty throughout the country. 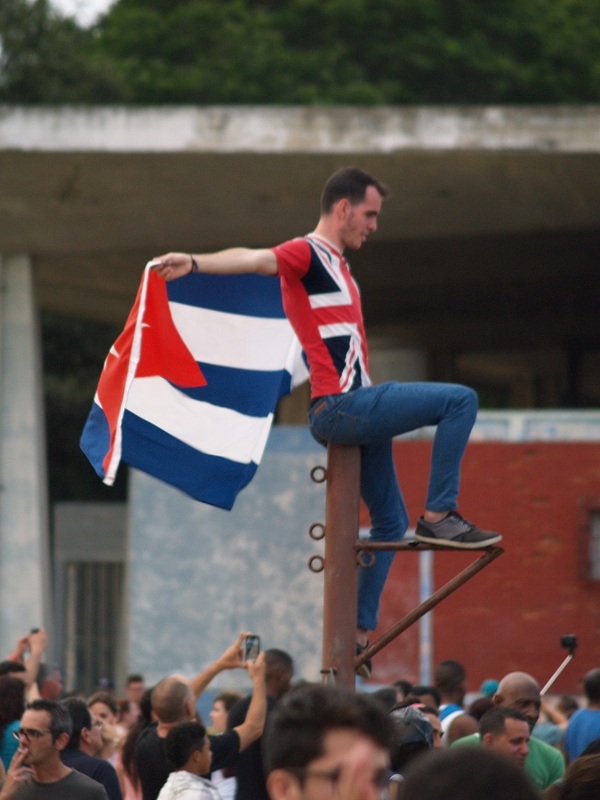 The Cubans we spoke to were very excited about Obama coming to Cuba, which occurred while we were in Cuba, and many voiced hope that much good will come from his visit as they took on a greater role on the world stage. And speaking of “stage” what a trip going to the Rolling Stones concert was. You might enjoy Brenda’s take on that. What a hoot! However, when you get right down to it, the most remarkable part of visiting Cuba for us was the people. We loved spending time with them, especially in the most rural areas. Brenda did a wonderful job of describing what this was like. I struggled to capture what made Cuba such a remarkable place for us to visit. This post was my attempt to capture this spirit. All and all, there is really no better way to visit Cuba than to cruise the coast and now is the time as it won’t be long until it changes forever. The pristine reefs, the dramatic scenery and, most of all, the people are remarkable. Don’t miss out. Looks like a pretty good start! I enjoyed your Cuba posts and sent links to several of them to many of my other friends and acquaintances. While I enjoy your commentary, I really enjoy your photography. More photos, please! This is a good start…..and as to your visiting Watermark…..I am sure you can expand on this…to include talking about each of your stops…with photos…..I am intrigued by the Guarda Frontera….and if you saw any military….which, as I recall you did not mention on your blog….also, did like your blog about the other cruisers that you met along the way in Cuba….talking about what the people are doing for a living….both rural and in the city… ..looking forward to your coming……I would think that most of the residents have never been to Cuba……but I know…… one…..my wife Barbara…..who was on a cruise ship with her parents……………..
Do try and give us some dates….that you could come….I know it may be early to pin point the date…..I would hope that the best time would be on either a Saturday or Sunday afternoon….will arrange for a reception after….with both you and Brenda…. We all look forward to your visit and presentation. I was in Havana when Castro took over. I recall Veradero as one of the most beautiful beaches I’ve ever seen. Cuba now should be fascinating to all of us.